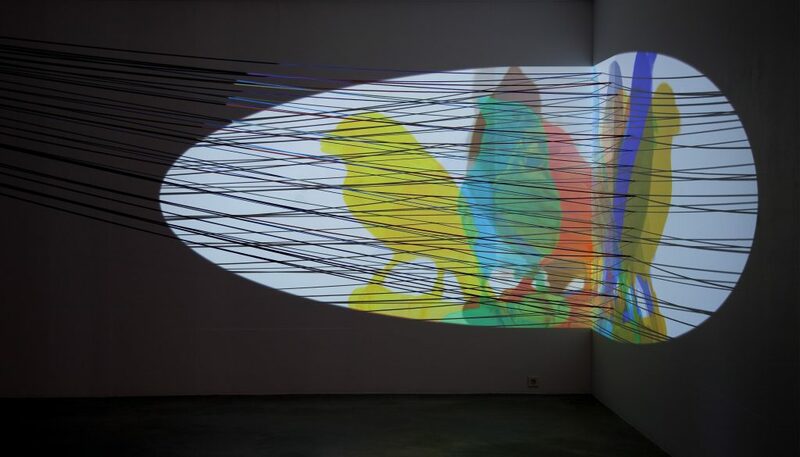 In Canary a video image of superimposed different-coloured canaries is projected onto a corner of the exhibition space. Overlaying the image is a tensed encircling bunch of climbing ropes casting shadows on it. Are you into climbing? No, but I became interested in it because it is about seeking an extreme experience, aiming for the summit. The present-day climbing enthusiast is like a properly equipped version of Romanticism's "wanderer" above the clouds. Climbers don't lend their ropes. They have to trust them, know their history of use, wear, elasticity and durability. The different colours of ropes represent specific uses. When hanging on the mountainside it is a relief to know what or who is at the end of which rope. Canary is based on the story of the breeding of birds, which is a direct metaphor of the painterly mixing of colours. The obsession with creating the red bird in the early 20th century is like the aim towards a perfect monochromatic painting. The notions of racial improvement have connections with contemporary discussion on the ethics of genetics. I also considered the connection between the purity of modern form and the idealistic point of view. When a painting or work of sculpture is reduced to its surface it is idealized to be only what we see in it. The visual motif of a work serves only as a composition. Are the birds in Canary copied from Internet pages? There is the vein of borrowing and copying running throughout this exhibition. The video piece Leda, Maiastra, Rooster and Fly was filmed in Constantin Brancusi's studio museum in Paris from behind protective walls of glass. The studio composition is viewed as a distanced image. Although I am standing before real, authentic objects, they remain distant. The birds in Canary are the result of breeding and are meant to be displayed. The birds on the related Internet pages are models, prime examples with regard to their colour. They appear there, in the role defined by their breeders. In the Unknown Untitled series you paint, in a scale of grey, a replica of the original work on top of a completed amateur painting. Is this about questioning the aura or value of the work? The most important thing in the paintings is the notion of authorship. I repaint the same work by replicating its technique and motif. The work is simultaneously both a copy and an original piece. When the style, motif and technique are defined in advance, the act of painting remains. Surprisingly, this method is very personal. I make myself the other author, in the role of another person, looking with his or her eyes. Whose painting is it ultimately? The work itself seems to fall somewhere in between these ideas. For me, the paintings are like an exhibition within an exhibition, actually containing the essential aspects of the other works, the notions of repeated exposure and copying. Greece is selling its beaches to pay its debts". News item on the webpages of the Helsingin Sanomat newspaper, 2 June 2013." selves and their artist. Greece, however, differs clearly from these works. I worked in the Sfakiotes residence programme on the island of Lefkada in Greece during the summer of 2013. Touring the island, I noticed several unfinished holiday homes and hotels on the slopes leading to the beaches. As "new ruins", the concrete skeletons of the buildings seemed to symbolize both the present economic situation and the continuum of architecture. In this work, these structures are combined and merged with images of insects, a radar tower and planes of colour. The piece is highly visual and it seems that colours and forms are of greater importance than the visual content? The encircling form of the composition is based on the Greek icon of the Prophet Elijah. I went to film in the mountains of Lefkada, which, as is often the case, are in the possession of the army and aerial surveillance authorities. On the highest peak there was a small Greek Orthodox chapel dedicated to Elijah. The radar towers in their function of surveillance and the prophet riding to heaven in his fiery chariot seemed to be complete concord. 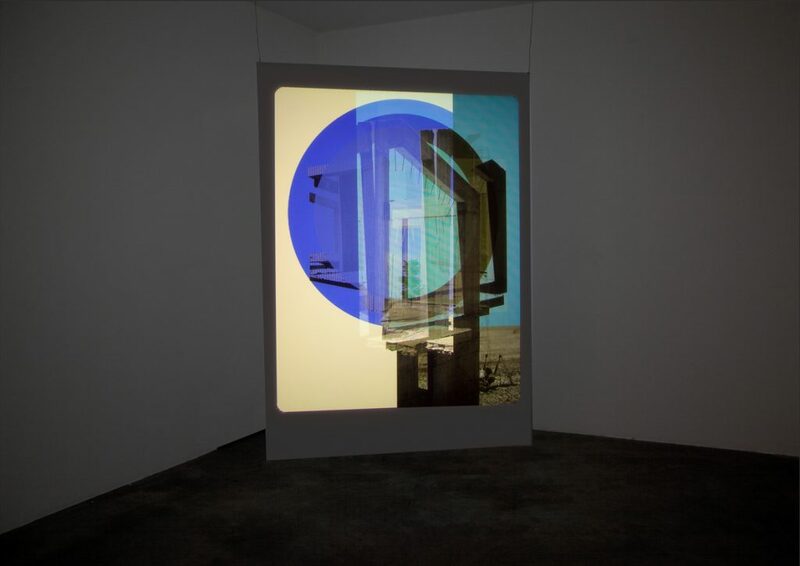 The work combines two unsynchronized video images, creating practically endless new combinations of images and meanings. Each viewer sees a different work, a new version of the combination of images. Could randomness be a metaphor of travel and continuously encountering new situations? When speaking of the works of Carlo Emilio Gadda, Italo Calvino aptly notes: "The work is unfinished and continuously changing. When depicting ruins and changing structures it is also, as a structure, the ruins of ambitious plans and a compilation of fragments." Perhaps Greece is something similar. © 2019 Vesa-Pekka Rannikko All Rights Reserved.